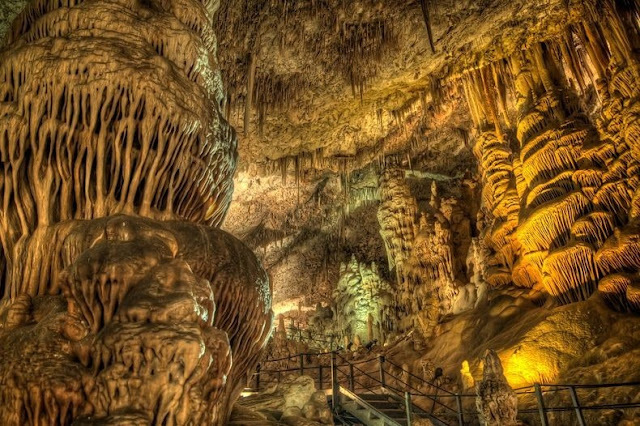 Avshalom Cave also known as Soreq Cave or Stalactites Cave is located on the western slopes of the Judean mountains near Bet Shemesh in Israel. The 5000 square meters cave has one of the most impressive collection of stalactites and stalagmites formed in a variety of patterns. Some of the stalactites hanging from the ceiling of the cave are up to four meters long, and in some cases they fuse with stalagmites growing from the floor. Other formations resemble shelves or sheets of cloth, branches, corals and clusters of grapes, among many other objects. The bizarre patterns at Avshalom Cave combined with the ghostly lightening creates a rather creepy ambience inside the cave. Stalactites and stalagmites are formed by water flowing from the ceiling to the floor of the cave, melting limestone on the way. Over hundreds of thousands of years, each drop of mineral-laden water deposited a thin layer of calcite on the ceiling and on the ground. Given enough time these tiny layers add up to form columns of calcium carbonate called stalactites and stalagmites.